Oracle 12.2 is available, although still only in the Oracle Cloud via Oracle’s Exadata Express Cloud Service and not yet downloadable for use on-premise, you can now start using the latest 12.2.0.1 version of the database. Probably the first thing you will notice is that there is now a dedicated “Oracle JSON Developer Guide“. The chapter about JSON in the XMLDB Developers Guide has been removed and replaced by a dedicated manual for JSON related database content. These operators have been announced and demonstrated, to the lucky one’s who were at Oracle Open World in 2015 or this year, and in the onsite hands-on labs. These operators will be incorporated into a future release of the SQL Standard. JSON_ARRAY, as it hints via its naming, generates a JSON array. 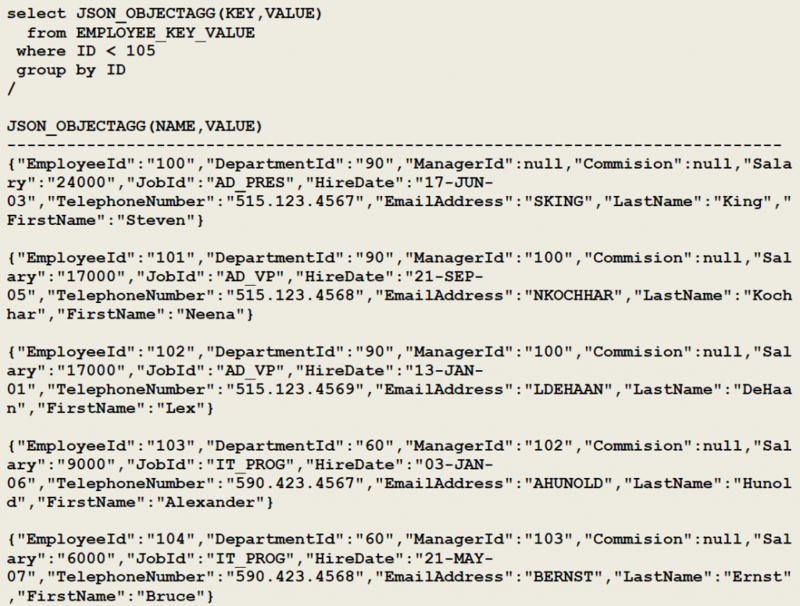 JSON_ARRAY returns each row of data generated by the SQL query as a JSON array. 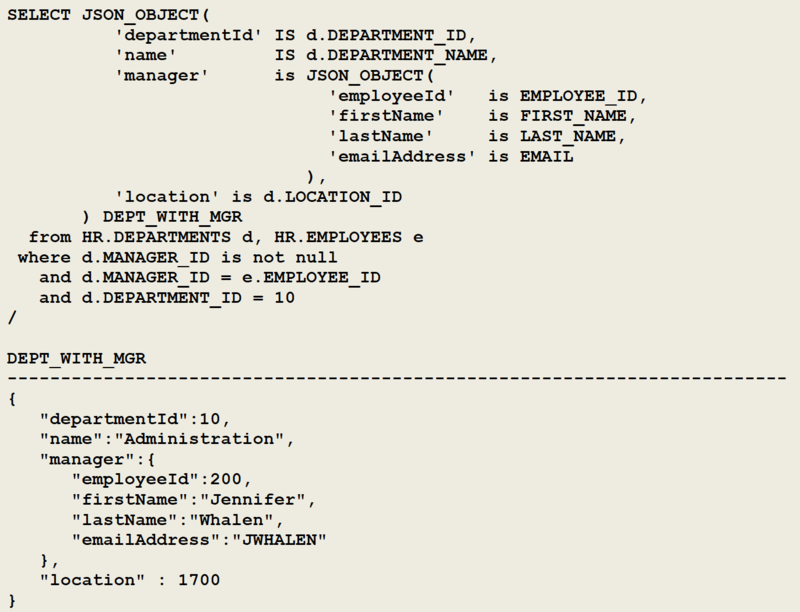 JSON_OBJECT returns each row of data generated by the SQL query as a JSON object. JSON_OBJECTAGG can be used to create JSON objects based, for example on key : value pair storage. 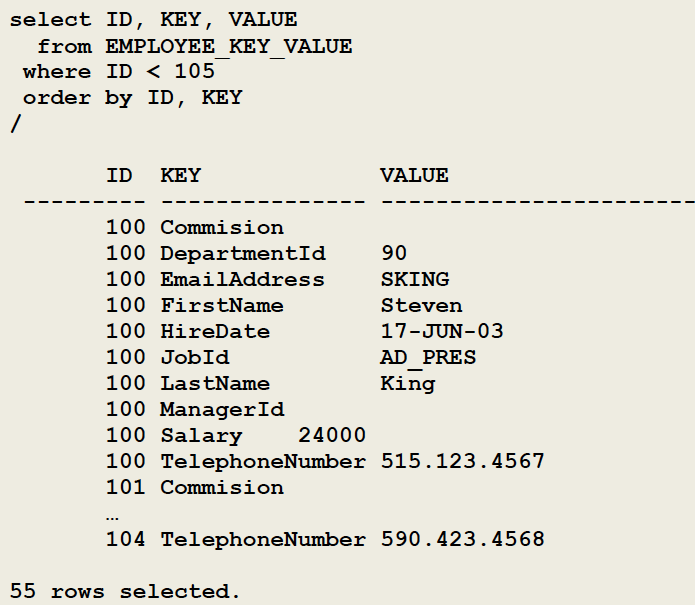 Have a look at the following statement of view EMPLOYEE_KEY_VALUE. 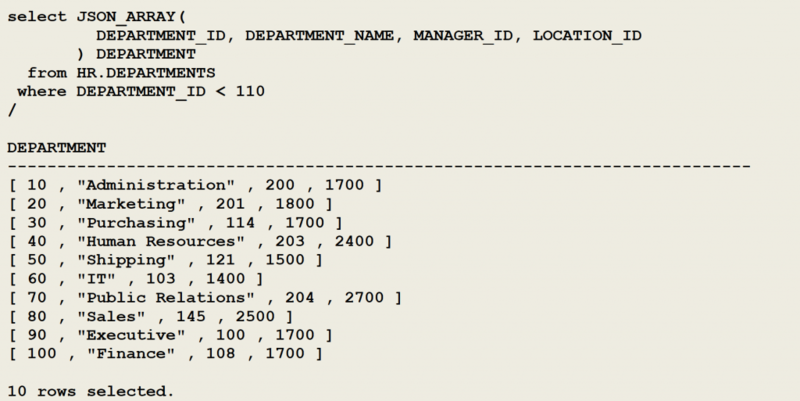 Hoped you liked this small overview / insight in the 12.2.0.1 version of the database. Have a go at it via Oracle’s Exadata Express Cloud Service. I reviewed the documentation you provided. I mean “Oracle Database JSON Developer’s Guide”. 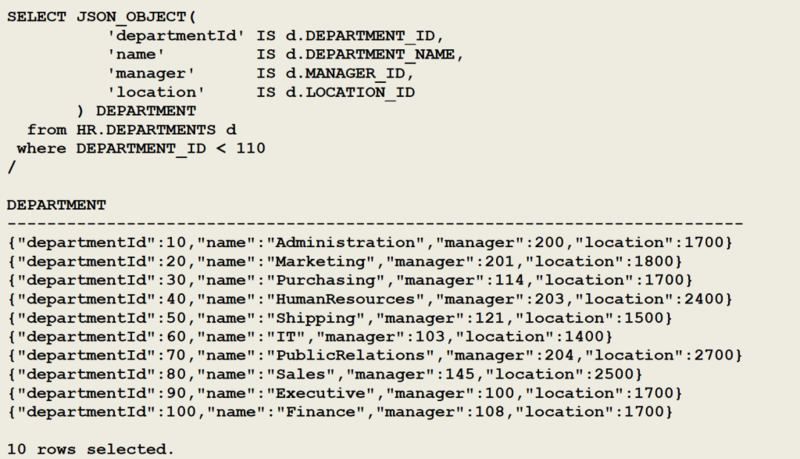 I haven’t found a way to transform a generic UDT into JSON and vice-versa. Do you know how to accomplish it in 12.2? For instance, XMLTYPE has such abilities. I can use XMLTYPE.createXML to transform UDT into XMLTYPE and XMLTYPE.toObject to transform it back. And that’s why I’m using XMLTYPE on my project now though my developers eager to swap it for JSON. It looks like JSON_OBJECT function expects scalar datatype. AFAIK, the Oracle development team responsible, is not providing a direct SQL/JSON operator for this in the (near) future. 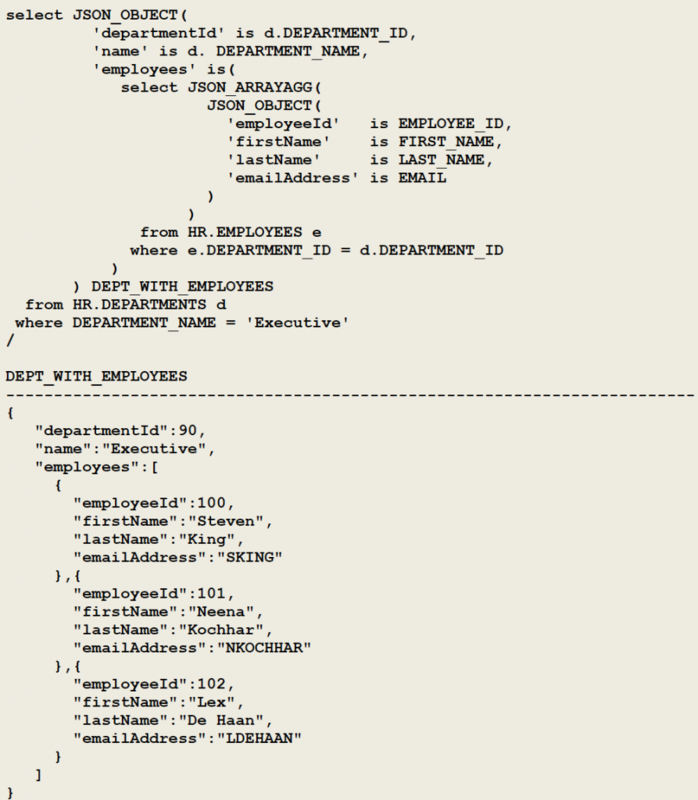 There might be alternatives via the PL/SQL JSON enhancements, but I haven’t got the time yet to post about it.